Just look at the pro peloton, where aero frames have edged out nearly all their predecessors in just a few years. You’ve certainly heard of Factor, whose engineers and factories were instrumental in producing the first frames to break the sub kilo mark, developing processes that have since been emulated by almost every major manufacturer worldwide. Factor has updated its aero frameset model for the 2018 season with changes that focus on aerodynamic performance and stiffness. What the Factor ONE has in common with its previous iteration is the unique split downtube design. Where it differs is in direct mount brakes and aero frame features including truncated tubing, internal cable routing and lowered seatstays. Each model Factor produces is designed to be the best in the field for that style of bike. The ONE is their all-out race weapon—aero, stiff but comfortable, and it should have great responsiveness. Dubbed the “Twin Vane Evo”, the bike’s split downtube channels air through the frame to improve aerodynamic performance, whilst still retaining stiffness at the bottom bracket with a continuous structure right through to the chainstays. 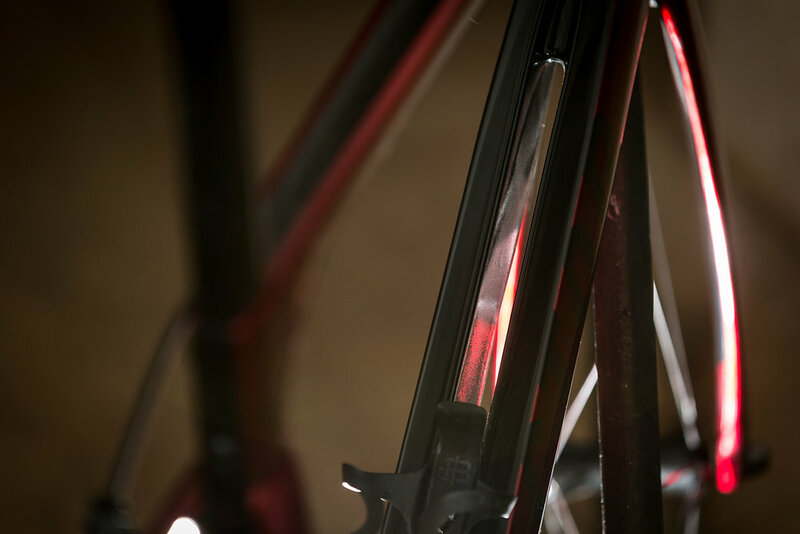 Starting at the rear of the rig and then moving forward, the lowered seatstays feature a wide stance design, which allows air to flow through the bike. It also offers greater clearance for wider tyres; in fact, up to 28 mm tyres can fit into the frame. Up front, the ONE Total Integration System (OTIS) includes wide stance forks and a new steerer design. The wide stance bladed forks encourage the flow of air, lessening aerodynamic resistance whilst increasing stiffness; the OTIS steerer is an external hinge rather than a traditional tube steerer. Over the last six weeks I’ve been putting this bike through its paces, keen to ride the rig fast. It just screams speed! The greatest advantage of pedalling a steel bike during summer is the swiftness felt when you jump aboard a roadie. Whilst the Factor ONE is not a climbing bike, the frame is light; standing out of the saddle, I felt zippiness on the inclines. The ONE is, perhaps, more of an all-rounder than just an all-out race machine. The frame—made to be quick—is stiff but relatively comfortable, in my case helped by the addition of 25 mm tyres. Over the past few years most “aero” bikes have lacked the capacity for larger tyres; the wider trend caught most manufacturers on the back foot. Factor took the bull by the horns, becoming one of the first to offer an aero frame that accommodates thicker rubber. You know autumn is here when moss reappears in the Waitakere Ranges and the roads never really dry up. A slippery road surface can cause you to tense up a bit or pull on the brakes: on the Factor One, however, I experienced no twitchy fingers. The rig’s smooth handling boosted my confidence, so I could tip the bike into tight corners without compromising any speed. Factor’s aero cockpit for the ONE—the OTIS Evo—allows for full internal cable routing. While this helps in the stiffness department and probably assists the AG2R sprinters, I found it too rigid for our roads despite the pleasing aesthetic of completely hidden wires. By eliminating the face plate and bolts, Factor claims it’s done away with unnecessary turbulence at the front end of the bike. After some miles on our chip seal roads, I found the overall ride quality was a little compromised. With an eye to speed, Factor includes CeramicSpeed bearings in both the headset and bottom bracket. If bought as a complete bike, it will be fitted with Black Inc fifty carbon clinchers, which also contain CeramicSpeed bearings. Factor’s complete build also includes in-house bar tape and a Fizik Arione saddle. The bike has the option of two groupsets: Shimano Dura Ace di2 and Sram Red eTap. I rode with the Black Inc fifty carbon clinchers laced with CeramicSpeed hubs. Ceramic bearings are one of the best upgrades you can make, as replacing all the rotating parts on the bike results in free speed! Black Inc wheels utilize an asymmetric spoke pattern: stouter spokes on the drive side, paired with minimalist spokes on the non-drive side. 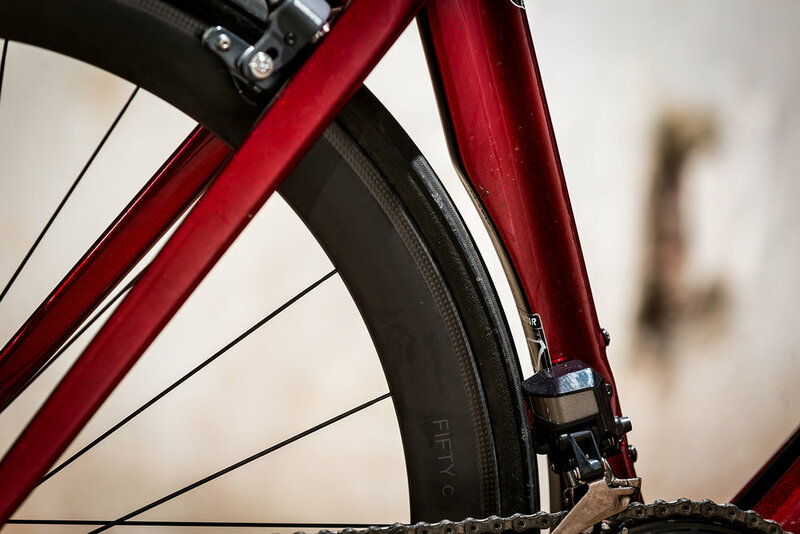 The result is a highly optimized spoke system, a wheel that delivers the most balanced combination of aerodynamics, lateral stiffness, low weight and maximized durability. The Factor ONE has a fluid feel, especially on the flats. This bike is incredibly aero, stiff yet also comfortable; Factor has done well to blend comfort and speed. And if colour is your thing you’ll love the Crimson Red colourway (available in other colours). This is one swift rig that demands attention from your competitors. Subscribe to our print edition for full Factor ONE review and the best of New Zealand Cycling. Specialized's Diverge is an all-road adventure bike that packs a lot of fun. OPEN is not your typical bike brand. Founded by the former CEOs of BMC and Cervelo, their business model is ‘working hard to stay small.’ We took the OPEN U.P, for a little all-road adventure. We take the newest Trek Checkpoint out for a little test.